A self-titled album nearly three decades into a career is many times a sign that the band wants to make a new, fresh start and take things in another direction and challenge themselves musically, which often turns out to be not that appreciated by the die-hard fans. There is of course no reason to be the least worried here. 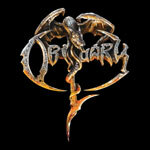 Obituary stays right on track and also manage to maintain the fresh and vital, almost rejuvenated, spirit that I felt they got especially with their previous album Inked In Blood (2014), following the adequate releases Darkest Day (2009) and Xecutioner's Return (2007). This is an energetic attack driven by a seemingly newfound passion and delivers quite a few good and sharp edged punches. This is classic Obituary without any surprises at all, apart from the subtle differences that there are a little less melodies and solos than on the previous few albums but on the other hand a bit more aggressive riffing, and something that could be taken for close to a rock/boogie rhythm in one song (A Lesson In Vengeance). The production is instantly recognized as the Obituary trademark, but however once again too thin, hollow and scaled off in my ears. Many fans like this kind of dry guitar sound, I don't. I want my death metal guitars fatter, juicier and more wet, so to speak. As said, this offers no surprises whatsoever. You get Obituary, and you get Obituary songs well written and executed even though I have to say there are quite a few passages and rhythms I feel I have heard before plus the fact that the album loses a bit momentum halfway.